Jason Cummings hit the winning goal as Hibernian edged out Dunfermline to maintain their winning start in the Championship. 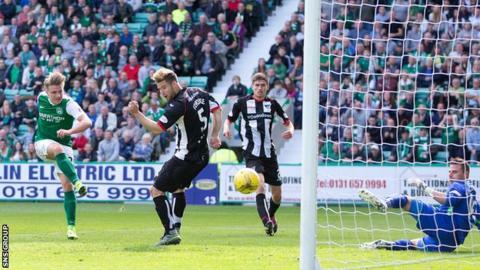 Pars defender Ben Richards-Everton skewed a header into his own net as Hibs dominated the first half. The visitors improved after the break and Gavin Reilly slid in the leveller after 58 minutes. But a blunder from Callum Fordyce allowed Cummings to slam the ball in from Martin Boyle's delivery. Cummings, who found the net 25 times last season, now has three league goals in two games for Neil Lennon's men, who are joined at the top of the table by Raith Rovers. Both sides looked cautious early on with chances rare at either end. There was a scare for the visitors midway through the first half when winger Joe Cardle was short with a pass-back, allowing Cummings to intercept. The striker's shot was cleared off the line, with Grant Holt blasting the rebound wide. The breakthrough for Hibernian came on 29 minutes with a fair slice of fortune going their way. A Darren McGregor header was cleared off the line, with Paul Hanlon sending the ball back in a busy penalty box with Richards-Everton's attempted clearance slicing off his head into the top corner of the goal. Roared on by a crowd of 16,477 - the biggest gate in Scotland, the goal gave the home side impetus, with John McGinn prominent in the middle of the park. The Scotland international twice threatened with long-range efforts, the first saved magnificently by David Hutton, the second deflected narrowly wide, while a looping header from Cummings came back off the post. Early in the second half, veteran English striker Holt wasted another good opportunity to get off the mark for Hibs when he lacked composure in front of goal. Just before the hour, Dunfermline drew level after excellent play down their left hand side. Cardle slid a great pass between defenders Hanlon and Liam Fontaine for Reilly to run on to and the on loan Hearts striker turned the ball onto his left foot before shooting underneath the advancing Ross Laidlaw. Dunfermline grew in confidence and enjoyed a good spell but it was the hosts who struck the decisive blow with 11 minutes remaining. Fordyce completely missed a cross from substitute Boyle with Cummings standing directly behind him to knock the ball home much to the delight of a packed Easter Road. Hibernian's Neil Lennon: "We have to learn to be better. Dunfermline came back into the game when we were on top. To their credit they scored a very good goal and then put a bit of pressure on us. We have to handle those spells a little bit better. Because good players began to look a little bit anxious. "I thought John McGinn had a wonderful game. From minute one to minute 90 he drove the game. A special performance. McGeouch and Boyle made a difference when they came on. My disappointment is we didn't get more from set plays as Keatings' delivery is very, very good. "Grant Holt is probably trying too hard. For someone of his experience he is getting into the right positions but he is rushing it. They will come. That's three games in a week he has played and he is contributing just fine." Dunfermline's Allan Johnston: "It was very harsh. If you look at the two goals we lost one was an own goal and for the other we just missed the ball. "There were a lot of positives, a lot of great play. We scored a really good goal ands you could see the crowd were getting on their backs the second half. We looked the team that we're going to go and score. You can't be critical of the players. I thought they gave everything. They were different class." "Obviously, Callum Fordyce is disappointed with the goal. It took a bad bobble and he has just missed it and not cleared it. But I thought it was an incredible performance for someone who has been out for that length of time and I'm sure he will be a massive player for us this year." Match ends, Hibernian 2, Dunfermline Athletic 1. Second Half ends, Hibernian 2, Dunfermline Athletic 1. Kallum Higginbotham (Dunfermline Athletic) wins a free kick in the defensive half. Substitution, Hibernian. Jordan Forster replaces Marvin Bartley. Foul by Gavin Reilly (Dunfermline Athletic). Attempt missed. Rhys McCabe (Dunfermline Athletic) right footed shot from the left side of the six yard box is too high. Substitution, Dunfermline Athletic. David Hopkirk replaces Michael Moffat. Foul by Rhys McCabe (Dunfermline Athletic). Attempt missed. Jason Cummings (Hibernian) right footed shot from outside the box is high and wide to the left. Goal! Hibernian 2, Dunfermline Athletic 1. Jason Cummings (Hibernian) right footed shot from very close range to the centre of the goal. Assisted by Martin Boyle. Foul by Ben Richards-Everton (Dunfermline Athletic). Corner, Dunfermline Athletic. Conceded by David Gray. Substitution, Hibernian. Dylan McGeouch replaces Liam Fontaine. Attempt saved. John McGinn (Hibernian) right footed shot from outside the box is saved in the top right corner. Liam Fontaine (Hibernian) is shown the yellow card for a bad foul. Ryan Williamson (Dunfermline Athletic) wins a free kick in the defensive half. Substitution, Hibernian. Martin Boyle replaces Grant Holt. Attempt blocked. Jason Cummings (Hibernian) right footed shot from the centre of the box is blocked. Attempt missed. Lewis Stevenson (Hibernian) right footed shot from more than 35 yards is close, but misses to the left. Rhys McCabe (Dunfermline Athletic) wins a free kick in the defensive half. Attempt missed. Jason Cummings (Hibernian) right footed shot from outside the box is close, but misses to the left.